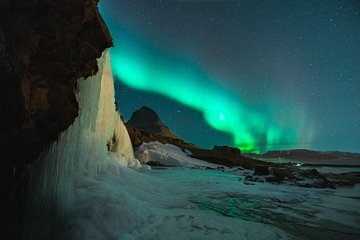 Spend the day exploring the waterfalls, geysers, and national parks of Iceland’s Golden Circle and at night venture into the wilderness to find the northern lights. Take in the scenery from the comfort of a four-wheel-drive vehicle between stops at Thingvellir National Park, Geysir Hot Springs, Gullfoss, Kerio Crater, and a local farm. Stop for dinner before heading back out to search for the northern lights.